600RR.net > Technical Talk > Exhaust & Fuel Delivery > 08 fuel pump issues... relay wont come out? 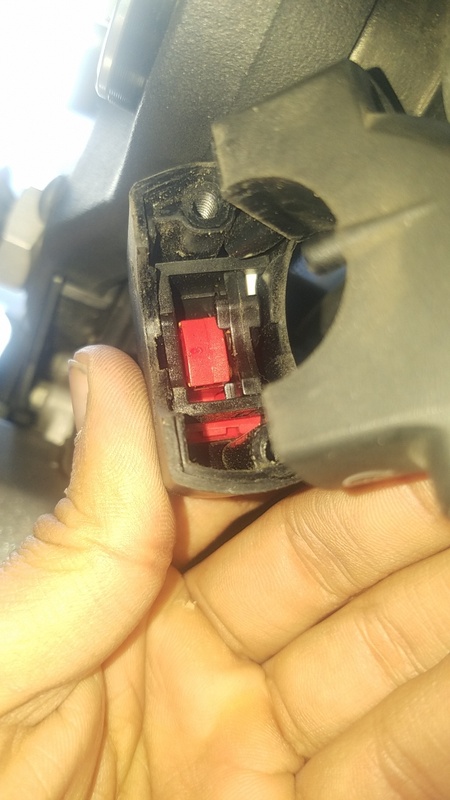 Hey guys, im having fuel pump issues on my 08 600rr. Bike cranks but does not fully turn over. Realized that the fuel pump was not priming. and from help and reading from a lot of internet sources, i found that the first thing to check would be the fuel pump relay. Went to check that recently and for some reason it does NOT want to come out. I read that you have to pull the relay out and test it using a multimeter to see if that is getting power and whether or not it is, you need to move down the line to actual fuel pump. ^^^ the bottom right black square box is supposed to be my fuel pump relay. I was trying to pull it out to test it with a multimeter, but it will ABSOLUTELY NOT fcking budge. anyone have a clue as to why i am unable to pull the relay out..? i dont think any of my relays were pulling out. I had the same problem a few years ago. 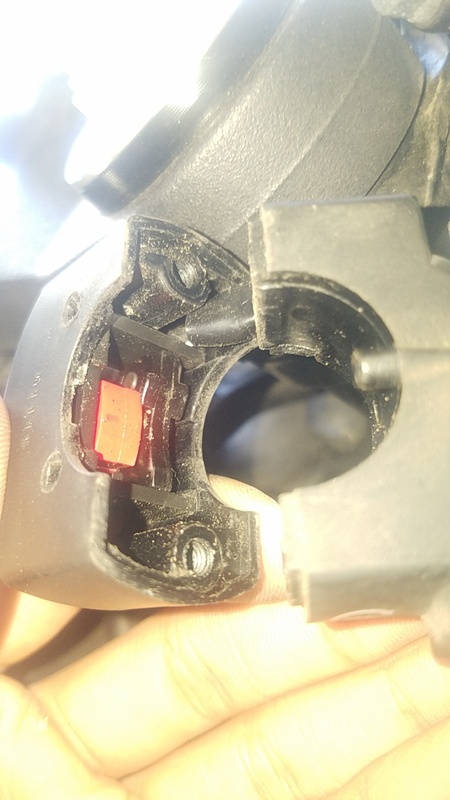 It ended up being the red ON/OFF switch (witch I believe the manual states you are not suppose to use every time the bike it turned off/on) If the switch does not have good electrical contact in the ON position, the fuel pump will not prime. There are a couple contact points inside the switch that can be lightly sanded to ensure good contact. I ended up hard wiring the switch to the ON position so I never get stranded like before. There are a couple write up on the forum about it. alright alright... i just tried to look at it, but couldn't get inside the housing.. found a few of the threads on it in the forum but the pictures were no longer there. im not the most mechanically inclined so i didn't know what to do once getting the two screws out. fuuuuu man lol, i was hopeful this would've been the solution and i couldve turned the bike on today damn. thanks for the input. Once you take the two screws out the switch should be in two pieces. Then you have to dive in a little further to the uppwe switch housing. In there is where you will find the contact points. I had this issue a couple of months ago. This became an absolute doozy for me... Let me run through a few of the things that I tried to solve this issue and then the annoying conclusion. I've got an 11 plate CBR, brought second hand that was in pretty good nick, though it had been sat around for a couple of years when I brought it. It started fine when i went to visit it but I obviously did a full fluid change on the whole thing. For the first couple of months it would run fine and had no issues that I could find. Then it started cutting out randomly, even whilst driving. After a lot of bother and searching I eventually found out the alarm immobiliser had a recall notice on it: Datatool S4 C1 Red of a specific year. https://www.datatool.co.uk/safetyrecalls4/ After getting the guys to come out and fix that the bike ran fine... for a while. Whilst I'd been going through the whole list of issues I'd replaced the battery, checked all the fuses, checked the relays, charged the new battery to full, removed the Kill switch and sanded the contacts, and checked the Bank Angle Sensor and the Kickstand Switch. After the recall replacement, everything worked fine... for a while. A couple of months back the bike started to stall whilst sitting at lights after some hard A road/Motorway driving, and dropping revs occasionally whilst driving along, or sat still at 3k revs+. After the bike had stalled it wouldnt start again for close to 3 hours, minimum, doing exactly what your video was showing. Worst part was, I couldnt replicate the issue in the garage. Again, started going through the motions, and a full charging of the battery was the only thing that seemed to cure the problem... I think. Basically I'd been overloading the bike with heated gloves and the alarm being a bit sensitive would occasionally go off during the night/day whilst I was away from the bike. I also mounted the alarm electronics package higher under the seat as due to the underseat exhaust I think the alarm electronics get too hot. As for the relays, I swapped a couple of these out, but if they've never been removed from the bike, they can be tight suckers. I would usually put a pair of pliers on each of them in turn and try pulling them straight out, quite firmly. If i got one of the four out, and it wouldnt matter what one, then it would give me easier access to the rest. Taking the problem as a whole, I'd say your best bet would be firstly, charge that battery. If possible get it checked for 'health' at a dealership, which shouldnt cost alot, and if its coming to the end of its life, get a new one. Next step would be to check out the alarm system, if any, you have on the bike. It could need a recall! If the recall had been more advertised for the Datatool I wouldnt have wasted a month without the bike. Third, check the Bank angle switch and the kickstand switch. These can be bypassed and eliminate them from the problem. Search the forums for more advise on that. After that, if the bike still doesnt start the last easy check is whether the relays have gone. It's unlikely but it can happen sometimes. Theres info on the forums for checking relays with a battery and a multimeter if you have one or can borrow one. Also, whilst youre under the seat check all the fuses. Just because. Once you're passed these steps you get into more complex tests that revolve around fuel vs spark. Fuel: is there fuel coming out of the tank when you crank. This means taking the tank off whilst leaving everything as connected as possible and seeing whether the fuel pump primes and pushes fuel through when you crank the bike. Spark: is there something to ignite the fuel. Take a spark plug out and hold it near a grounded portion of the body and see whether a spark happens when you crank the bike. These are the two only things you need to make fire, 'engine fire' that is. Honestly, I hate electrical issues because they can be a righteous b---- to sort out and thats coming from someone who is happy to do pretty much anything mechanical to a bike so you saying your not that kind of minded, this may involve a trip to the garage, probably on the back of a trailer/inside a van. Also, just as another quick idea, when you crank the bike, if you crank it for 10 seconds or more, you can get the bike to display the error code relating to the bike not starting. Something thats quite easy to check. Hope you get it sorted mate, and keep us updated in this thread if you can. Always good to hear how problems get fixed. this one is easy, it's not your fuel pump relay. when you hit the kill switch, the FI and HESD lights didn't come on. so your ECU is not powered up. the logic in these bikes is VERY simple. the kill switch powers up the ECU through the engine stop relay. 12v goes to the kill switch, from the kill switch it goes to the coil on the engine stop relay, the negative side of the coil on the stop relay goes to the bank angle sensor where it is switched to ground. when you toggle the kill switch, if you do NOT see the ECU power up (FI light and HESD light), then you have a problem in this circuit. if you have a multimeter it's very easy to test. if all these are good, now check for 12v at the red/blue at the bank angle sensor, if you have 12v there then the BAS is bad. connect the red/blue to green at the BAS and see if the pump primes. if you do not have 12v on the red/blue the engine stop relay is bad. chances are you'll find the issue before you get to step 4 and 5. Wibbly, the local genius/hero, ladies and gents. jesus haha, thank you. yeah i definitely know very little about electrical components of a bike and this step by step help provides a lot of reasoning and cause/effect. i was able to hand motion a mapping of what you just explained and imagine for myself how the electric circuit works around the kill switch/BAS, thank you. and yeah the HISD and FI light don't come on, wouldn't in a million years have thought to look at that, i was almost ready to buy a fuel pump soon within the week. and yeah i did the "check for clicking" test at the relay earlier and didn't notice anything, which was leading me in the direction of blaming that relay initially lol. now this is probably going to sound stupid, but when im checking for voltage on these, do i use the negative or positive sides of the multimeter? and do i just check for voltage at contact of the multimeter lead and the wire(touching the lead to a wire)? I've got an 11 plate CBR, brought second hand that was in pretty good nick, though it had been sat around for a couple of years when I brought it. It started fine when i went to visit it but I obviously did a full fluid change on the whole thing. For the first couple of months it would run fine and had no issues that I could find. Then it started cutting out randomly, even whilst driving. thanks for your help man! yeah i 100%% feel you lol. i was in the same exact boat at the time of the video, i had literally just replaced all fluids and replaced my rotors that got damaged and was so eager to hear my bike fire, but nope lol. and yeah my bike had an issue with the cutting off while riding too a while back, and the same thing, kill switch was at fault. at the time i was taking it to a mechanic for that since i had no clue about anything and he said it was wired stupid like from a previous owner. after seeing the explanation from wibbly above^ it makes complete sense why that would be the area at fault. the first person to reply in here stated the same thing too but i was just unsuccessful at going about the job lmao. good to know that 10 seconds is what it takes to display an error code, i had no idea lol. and yeah the fuel pump and spark plugs are what i was led to at first when googling and youtubing a million things, thankful its likely not the pump, but the spark plugs ill probably be getting around to soon enough anyways, at least inspecting. will definitely keep this thread updated, and forsure for the next person who may google and stumble upon this thread haha, ive had issues solved the same way. once again thank you for your help guys, appreciate it. I got a few exams coming up so i probably wont get to this for a couple days to a week. Last edited by thatkidpb; 03-20-2019 at 01:16 PM. when you're checking for voltages put the red lead on the wire and the black lead on battery negative. an easy test to start with is to unplug the kill switch pod from the harness, and install a jumper (paper clip) between white/yellow and black. Ok... So I got another video of me trying to turn my bike on and these lights did come on. Does that mean my Killswitch is fine? And that the issue is back to being the fuel pump? edit: maybe nvm lol, looks like its the same lights from the previous video. they just dont stay on. Last edited by thatkidpb; 03-26-2019 at 06:59 PM. if the lights come on your entire engine stop circuit is fine. alright... so i finally got around to using a multimeter to check voltage in the wires around the kill switch connector, the yellow/brown and looked at the wire on the other side of the connectors as well. The yellow/brown wire from the killswitch to the connector had 0 volts when i flipped it on, but the wires going to the connector from the battery had small readings while the bike was in the "on" position. so after reading what you said @wibbly, this means that power is going out from the battery to the killswitch but the killswitch is not returning anything back? i then got around to opening the kill switch to clean the contacts but this is where i am stuck. I tried looking up that thread you mentioned @wags81, and i think i found it: https://cbrforum.com/forum/cbr-600f4...-135953/page2/ the guy had super zoomed in images of inside his killswitch but on an F3, but it looked similar. but what he didn't really explain was how/what to clean. it also took me a while to figure out how to get my killswitch disassembled, when i took the 2 screws from the housing off, the thing didn't just pull apart into 2 pieces. i had to like peel it the top end off enough to just pull it off the handlebar itself. so the thing is still in like 1 piece but it opens like pacman. the red switch itself i have no idea how to pry out from the black part, so im not too sure how to "clean the contacts". Last edited by thatkidpb; 03-29-2019 at 03:52 AM. there is a yellow/red wire, but that's the output to the starter relay, there is NO REASON for that to have any voltage on it unless you are pressing the start button. i can't come there and hold the meter leads for you, but PLEASE JUST READ. the kill switch connects the white/black to the black (white/yellow to black on the bike side of the harness). if you do this with a jumper (paper clip or similar) then you are doing what the kill switch does. if this fixes the issue then the problem is the kill switch. that's all i'm doing. i'm done. i'm out. good luck. ah sht sorry, i definitely remembered the wrong directions when i went outside to work on my bike. the brown and yellow was just a colorblind thing with red and brown but i'll make sure to check those white-yellow/white-black wires soon. i had some other issues come up and had to fix those before moving on. thanks again for the direction. im just about to write down a to do list with how tos in a notebook before i go out again.